Posted by Mike Gospe in Marketing Operations, metrics. Posted by Mike Gospe in Integrated Marketing, Lead Gen.
One of my most favorite lead gen programs I worked on was about 10 years ago when I was VP of marketing for a knowledge management start-up. This was during the early days of online search. Using today’s terms, we offered a software-as-a-service (SaaS) product/service that allowed users to get immediate answers to their questions. What was unique at the time was that our engine was very advanced and would offer up correct and relevant answers as opposed to a laundry list of links. Since we were a start-up, our marketing budget was non-existent. Our objective was to seed our sales pipeline quickly with a dozen well-qualified, brand name customers that we could eventually use as public references. Our only choice was to approach this project as a guerilla (see Jay Levinson’s many books on Guerilla Marketing). So, we got creative. We built our own list of target companies. We carefully matched our product strategy with a prioritized set of target segments. Rather than blanketing all potential audiences, we produced a list 500 target companies. We needed wins quickly, and we felt we had a good story to tell. So, with a laser-focused ambition, we set our sites and did not waiver from them. We created a standard email for this program, then tailored it for each CEO. Our email (ghost written for our CEO) was one paragraph in length and included a mocked-up screen shot of how our product would look on the target’s website, under their brand. So, while the data in the screen shot was bogus, their company logo, homepage design was obvious. Several energetic souls in our support team built these screen shots for us. The call to action was personalized by our CEO. It may seem ironic, but our goal was not to sell our product. At least not at first. Instead, the text of the email illustrated our idea/value proposition. We showed the mocked-up screenshot to show how our product/service might look on their home page. Using regular language (not jargon or energized marketing-speak), we asked them if they thought this was a crazy idea. In closing, we asked them to contact our CEO to provide us with some feedback. The telephone number we provided was to a new line that that marketing team would answer as if we were the CEO’s office. We created a separate email mailbox for our CEO and distributed these emails from that account. Twenty emails were developed and dropped each week. (Remember, we had no budget to outsource any of this work.) It took time to tailor each email, but we didn’t want to wait for all 500 to be ready. Also, by staggering the drop, we could learn how effective we were being by watching our response rates. We successfully ran the program for 6 weeks before we claimed victory. We received a 12% response rate and won audiences with a number of brand-name customers. My personal favorite was an email response we received from Michael Eisner (then the head of Disney) who directed us to follow-up with his VPs of marketing and support. Everyone was copied on his response; the skids had been greased; we were in business! Have a creative lead gen story to share? I’d love to hear it! Posted by Mike Gospe in Integrated Marketing, Marketing Operations. There is an art to crafting marketing blueprints. Although the concept is simple and intuitive, it takes practice and patience to work the model. More than that, it takes time to show colleagues in marketing and sales that the model really does work. Proof will be found in producing better results (i.e. more, better quality leads) while reducing internal frustration and the need to rewrite copy over and over and over again. What’s needed is a quick win! Not long ago I worked with a company who had scheduled a webinar that would take place in 3 weeks; yet because the marketing staff (5 people) was so stretched, no pre-marketing for the event had been considered. Their answer was to outsource the entire production to Ziff Davis — a webinar turn-key solution with a guarantee of 250 registrants. After interviewing the team, I sketched their initial blueprint, shown below. Because of trust issues, sales requested that all 250 registrants be immediately turned over to sales. I suggested that if this plan were executed as outlined above, the only thing I could guarantee would be that each team would be unhappy with the results. How do they want to be communicated with? What offers do they want/expect from us? After they respond to the first activity and offer, what happens next? And what happens after that? What happens if they don’t respond? How will these activities and offers help qualify these prospects? As a result we crafted the final blueprint. Instead of relying solely on Ziff Davis to promote the event, we discovered 5 additional pre-event marketing tactics that could be easily coordinated. 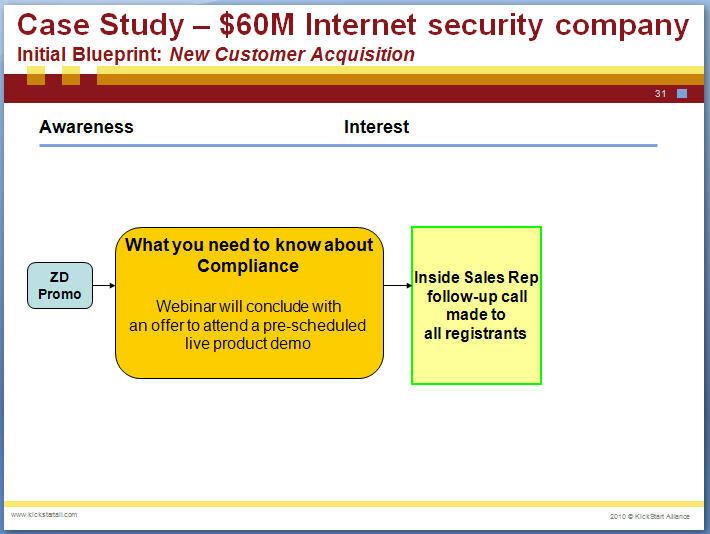 This was a thought-leadership webinar. The next logical step in our dialog with prospects was to direct them to a product that best addressed the issues raised during the webinar. We wondered if any attendees were interested in taking the next step with us immediately. So, we included an immediate call-to-action to stay on the line to see a product demo. Most folks dropped off the line, but more than a few stayed on! In the days that followed, two separate conversations would unfold: one for prospects who registered and attended; the other for prospects who registered but did not attend. Our blueprinted program was designed to last 4 weeks. At which time we would regroup with sales to review the number and status of the inquiries and leads. Instead of 250 registrants, we generated 1,050. 497 touched our company at least twice during the 4 weeks that followed the webinar. These were the leads that were passed immediately to sales. The others remained in an ongoing marketing nurturing program. How much did it cost to rework the blueprint? Absolutely nothing except 30 minutes of time to plan. Literally. Qualitatively, the marketing and inside sales teams were doing high-fives down the hall. A whiteboard kept a running tally of our leads for all to see. The marketing had secured it’s first quick win. With a renewed sense of partnership, the team moved on to tackle more comprehensive blueprints. More details of this story are shared in this article. Posted by Mike Gospe in Integrated Marketing, Marketing Operations, Social Media. Marcom teams are moving so fast that we sometimes overlook how all of the pieces fit together. I’ve used variations of this graphic throughout my career to help align marketing teams as we explore, debate, and decide upon the optimum marcom mix. As leads are generated and prospects are nurtured from "awareness" to "decision", this graphic maps the high-level marcom objectives to a few marcom activities and tactics. The central marcom objectives are noted at the top. Prospects will never buy anything from us if they don’t know who we are. So, we must invest in building “awareness.” Once they are aware of who we are and the value we provide, we can begin to encourage “preference” in our solutions. As we nurture prospects and learn more about them and the problems they are interested in solving, we can then present alternatives and showcase our points of differentiation. When prospects have collected information and are evaluating alternatives, that’s when we enter the “decision” stage and go for the close. This is when most marketing teams drop the ball. The process isn’t over; we want to encourage “repeat business”. To do so, continuing the dialog and staying in touch is critical. Programmatically, there are two types of “master programs”, underneath which there will likely be many variations. However, at the “master” level, we are either driving/developing new leads, or we are nurturing a prospect database or our own internal customer base. It’s important to recognize that different tactics, messaging, and timing will apply. The dark gray boxes represent a sampling of a number of marcom tactics that are being used today. In general, these tactics work best when mapped to the appropriate marcom objective. For example, using a PPC tactic to try to close a complex sale will likely not work very well. But, as a way to garner some initial awareness and interest, that’s a helpful tactic. The point here is to carefully select which tactics to use, and when, in order to achieve the maximum ROI for your marketing investment. I share this graphic not as a defined concrete model, but as a flexible framework that can help you and your team explore marcom mix elements and discover/debate which ones you think will work best. Understanding how all the pieces fit together is critical in being able to design a truly integrated marketing campaign. Posted by Mike Gospe in Integrated Marketing, Social Media. I have a hard cold truth for marketers: we are no longer in complete control of driving the lead funnel! As recently as a couple of years ago, marketers were. The lead funnel was driven by our pushing messages out to our target audiences. We controlled the message, the media, and the timing. Social media has changed the dynamics. People are finding out about our companies and products before they even get on our radar screen. Some sources even estimate that 90% of the customer’s buying process takes place without the aid of a sales rep! This has huge implications for our marcom mix. The upshot: we must help our companies become “findable” in a marketing landscape we no longer control. Captured = easy-to-read content posted in a friendly format that can be cut-n-pasted and downloaded, and . . .
Today’s lead gen programs can produce higher ROI if they combine elements of both traditional “push” marketing (where you control the message) and “pull” marketing (where we offer information on non-corporate sites and we listen to and monitor the discussion around us). The example shown in the above illustration is based on a real marketing blueprint being executed today by a local hi-tech company. There’s more to the story, of course. But this gives you a flavor on how and where social media is being used to complement traditional outbound marketing activities. How will all this play out? I’ll let you know when the campaign concludes in November! How are you using social media? I’d love to hear your stories. Posted by Mike Gospe in Integrated Marketing. Lead gen blueprints come in all shapes and sizes. However, there are common best practices that continually and consistently work well together. In my latest article, “Mechanics of a Lead Generation Blueprint” (as posted in the June KickStart Alliance enewsletter) I’ve highlighted aspects of both “push” and “pull” marketing activities and how they work well together to nurture prospects through the lead funnel. This particular blueprint is centered around an upcoming webinar. Quite often, marketers focus on a single event (like a webinar) without considering all the valuable pre- and post-webinar marketing activities and offers required to maximize the number of qualified leads surrounding this event. Marketing is not about a singular event or activity. Marketing is a process that must be nurtured to drive the best results. Have a look at the blueprint and feel free to shoot me questions and comments. 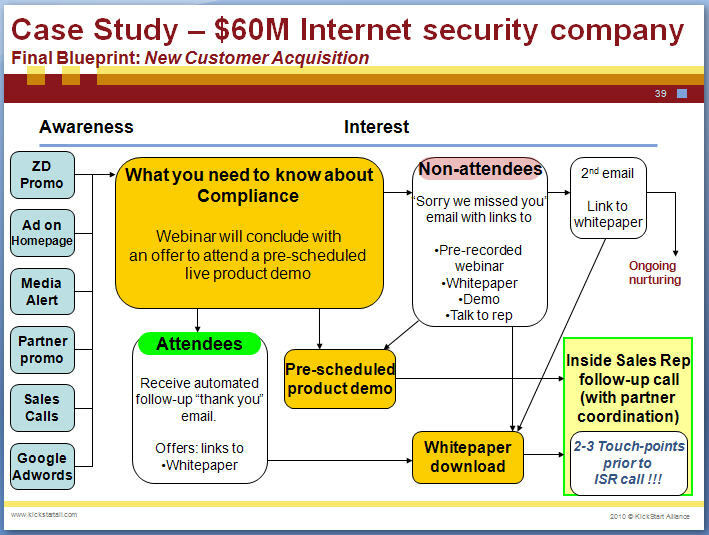 I’ll continue to post various examples of other lead generation blueprints in the future. This “best practice” comes from Carol Hague. Carol is an experienced integrated marketing campaign manager and offers a helpful approach to mapping marcom activities and content appropriately to the lead funnel. 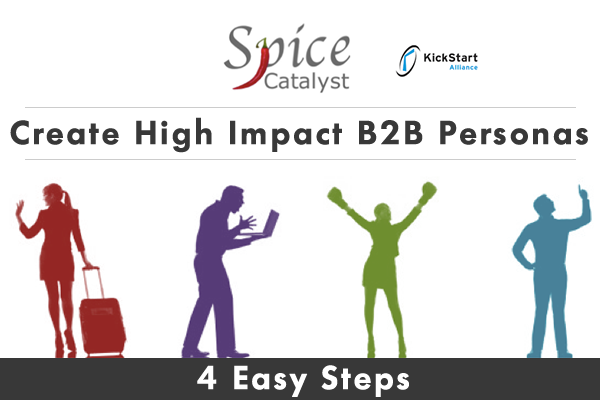 She and I collaborated on this graphic and share it as a powerful reference tool for B2B marketers everywhere. This is by no means a comprehensive list of available activities and content types, but it is enough to help guide teams as they draft their marketing blueprints. I offer this graphic as a companion tool to the marketing blueprint examples you can find elsewhere on this blog and in my book, Marketing Campaign Development. What suggestions do you have to make this tool/graphic even stronger? I’m listening to Miles Davis’ Kind of Blue and pondering one of life’s deep questions: what defines great jazz? We all know great jazz when we hear it. But why exactly is his music so good while jazz performed by so many other musicians just don’t quite measure up? The simple answer for me is: it’s his bands’ ability to listen to each other and the spaces between the notes. Great jazz groups are great not only because each musician is an expert with their own instrument, but also because they know how to play as a group. They know how to listen, to set the cadence with piano, drums, and bass while the trumpet or sax dances on notes following a spring breeze. They know never to play over each other, but to take turns to highlight the uniqueness of each individual instrument — for example, to create space so the bass can rise above the rest and impart its own magic in the mix. Listening and adjusting for the greater good of the tune is what it’s all about. The star may be Miles, but do you think he discounts the value Bill Evans brings on piano? No way. The same goes for understanding what makes great integrated marketing campaigns. The marketing functions are the instruments; the campaign is the tune. Consider a product launch campaign where “thought leadership” webinars, executive presentations, Google adwords and syndicated articles provide the cadence, just like the piano, drums, and bass. Momentum towards the product launch date builds with direct marketing and social media commentary, just as the trumpet rings the notes of the melody. The cadence of the piano, drums, and bass continues to nurture our ears as we prepare for the solo. Then, with rising anticipation, a press announcement and customer event punctuate the timeline just like a euphoric saxophone solo played by John Coltrane. Our story unfolds which each marketing vehicle being highlighted at the right time, all with a single purpose of supporting the campaign. For me, this lesson hit home when I joined a jazz combo group. (I play piano, but I’m not quitting my day job.) It’s easy to play with a group and sound crappy; playing like Miles takes dedication to check your ego at the door, listening to each other, and holding the greater good of the tune above any individual instrument. That is the secret. My prescription for success: take time out of your busy week to listen to your favorite jazz tune. Listen for the spaces between the notes. And enjoy! What’s your favorite jazz tune? You’ve read the book and used the templates. Tell your story. Click the picture below to add your review. Learn how to build, critique, and apply positioning statements. "Do we really need a positioning statement?" Say no to "marketing popcorn"